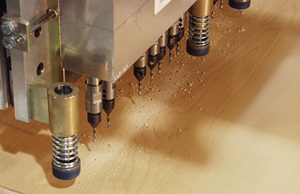 Cabinet Component Drills – Creative Automation, Inc.
Creative Automation Cabinet Component Drilling Machines are custom engineered and automated for a variety of cabinet applications. 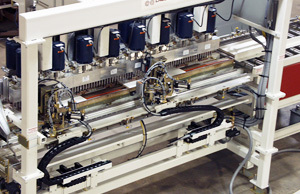 Servo-driven, feed through drill in a kitchen cabinet panel manufacturing cell. Closeup of feed through drill. Storage cabinet panel drilling and routing machine. When its Designed Right, Built Right and Installed Right... It Runs Right. Founded in 1971, Creative Automation has continuously set the standard for excellence in automated material handling and processing equipment for the wood and related industries. With customers among the most recognized brands in the world, Creative Automation maintains a philosophy of personalized attention and individualized solutions for wood production facilities throughout the U.S. and Canada. 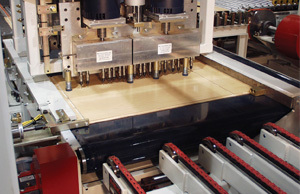 Our expertise in nearly every aspect of wood and related processing automation enables us to stand ready to help solve your production challenges. Guards, shields and safety fence may have been removed in photos for illustration purposes only. Do not operate a machine without guards, shields and safety fence in place and functioning. Copyright 2009-2017 Creative Automation, Inc.